Not so long ago, I tended to associate Long Island with being stuck in squawking traffic on the LIE and guys in wifebeaters who wouldn’t think to eat an apple if the tree plopped one in his hand. True, the eastern trail of New York City never exactly conjured an agrarian idyll, replete with rustic farmstands and coastal pastures producing everything from grass-fed beef to tasty wines. But perhaps that’s just the Jersey in me speaking (ironic as it may seem, New Jersey and Long Island kids have a long, stupid rivalry). 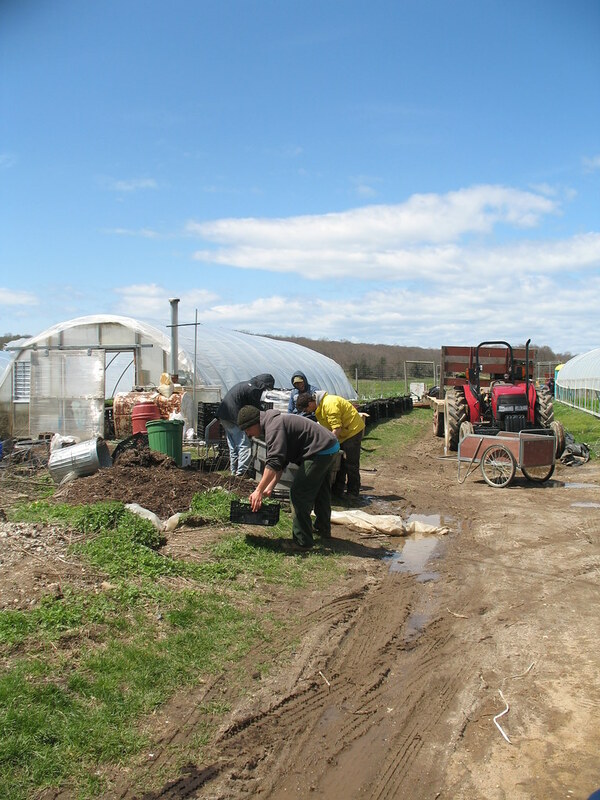 Because after a trip out to Garden of Eve organic farm in Riverhead, I was introduced to a world of old-school farming values being led for the most part by young and fresh-thinking pioneers. 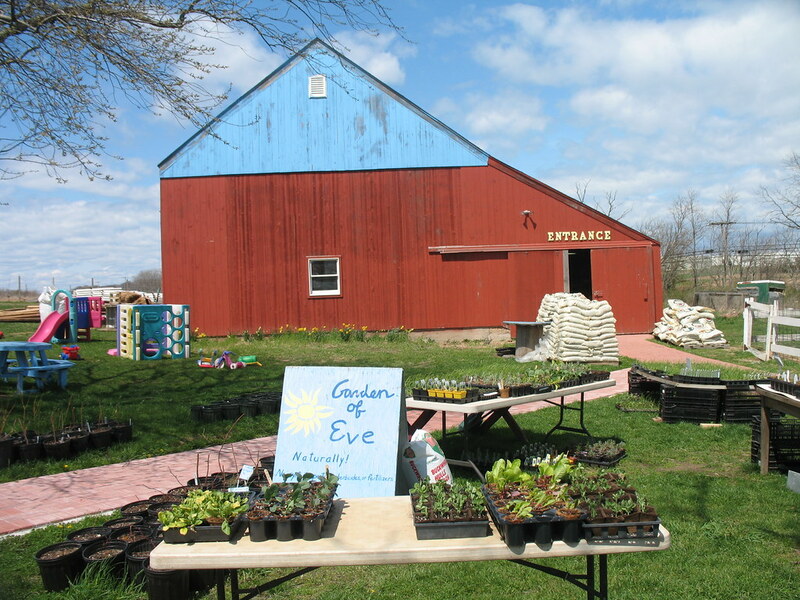 Garden of Eve farm really began as just a garden — Eve Kaplan-Walbrecht’s, to be exact. 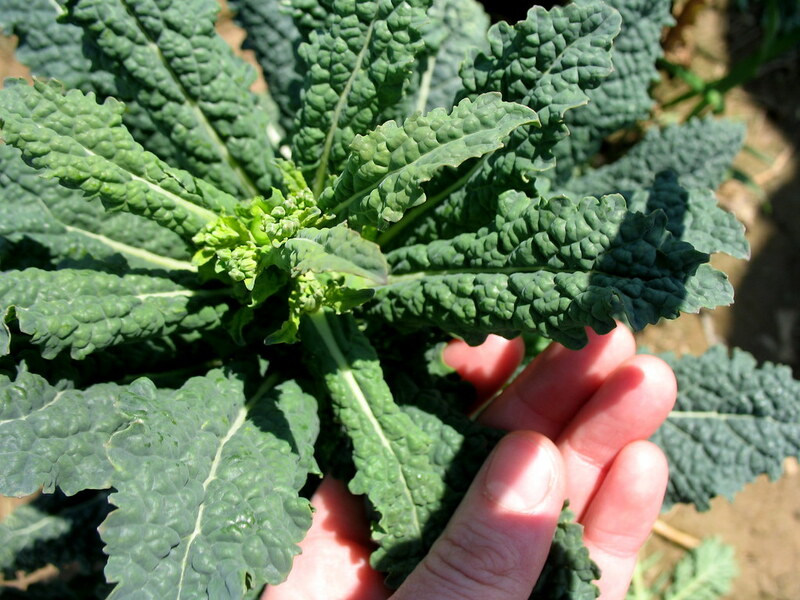 In 2001, a friend invited her to sell some of her vegetables that she’d grown at a farmers’ market in Long Island. She made $40 that day, and decided to take gardening to the next level. 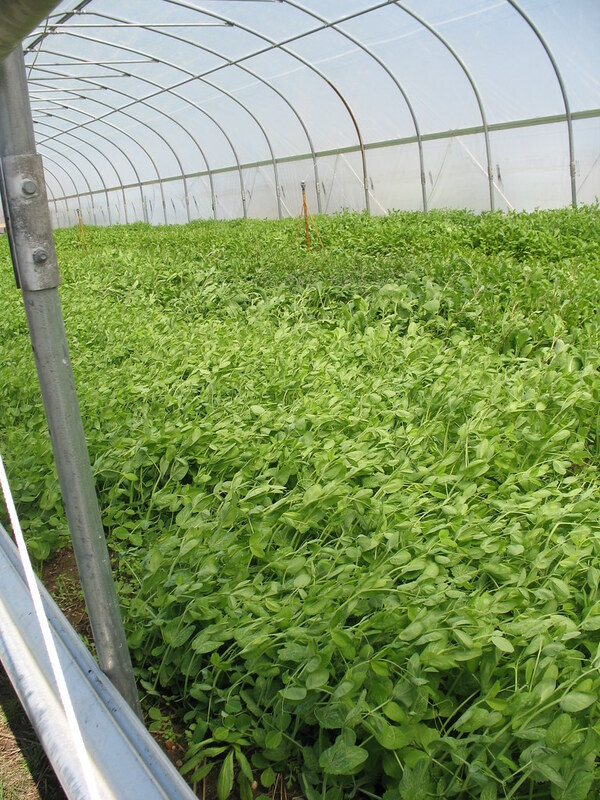 Today, the farm boasts 70 varieties of vegetables, 20 herbs and 30 flowers, all certified organic, across its 100 acres. 500 Rhode Island Red laying hens run wild and free, producing rich eggs that keep the customers coming back. There are seven beehives, not so much for producing honey as to promote a healthy ecosystem. This spring, the farm welcomed a small handful of baby lambs to join their few goats, sheep and guard dogs, and next weekend, they’re planning to bring some piglets down from Vermont’s Tamarack Hollow Farm. Along with her husband, Chris Kaplan-Walbrecht, Eve maintains a rigorously pesticide-free safe haven and believes in free-range, humane and healthy practices when it comes to food. A longtime environmental advocate, Chris grew into farming on his family’s conventional dairy farm. In a recent Long Island Press article, he lamented the exposure to toxic chemicals in that environment, and vowed to farm organic only for the benefit of the environment and human health. 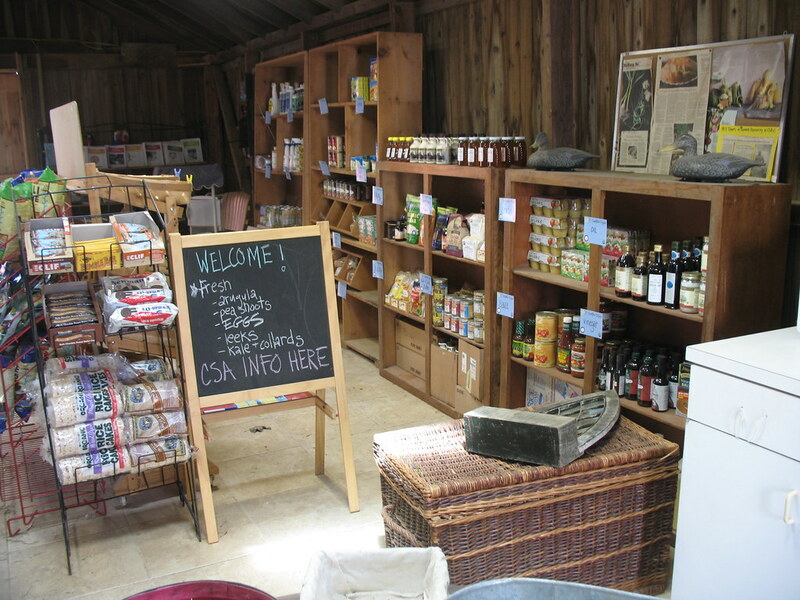 In addition to Garden of Eve, Long Island has seven other organic farms. While the sights alone were certainly a foodie’s paradise, my main reason for coming to the farm was to visit my friend Melissa (aka Midge Pingleton), currently soaking up the farm life as a live-in apprentice. I didn’t get to stay as long as I’d hoped, to help harvest and pack some of the last winter CSA shares (the farm serves ten CSA locations), so only got a taste of what it’s like to tough it out on the field from morning to dusk. I don’t imagine I would be very good at it. In late April, the field was windy and a week’s worth of rain had muddied almost every step. Nevertheless, I found Melissa and a handful of workers far, far down from the farmhouse in the field when I arrived, just finishing up their morning chores. Melissa was excited to find some kohlrabi she’d been searching for among patches of last winter’s crops. It’s an in-between week, or month, for farms in the metro area, straddling the winter and spring’s first harvests. According to the workers, the farm will “get crazy” with activity pretty soon. Along with Melissa, there are five other apprentices currently working on the farm, and six full-time staff including Chris and Eve. Their ages range from the early twenties to late thirties, most of them on the younger end of the spectrum. Many have worked at various other farms over the years. But Melissa (and many other young people in recent years, it seems) has taken to farming as an educational experience and conscious escape from city life. Previously a cook at Roberta’s Pizza and a Greenmarket Manager for CENYC, Melissa had been living in Brooklyn, and I might mention participated in almost every cook-off written about on this blog (including the s’MACdown, which she hosted). 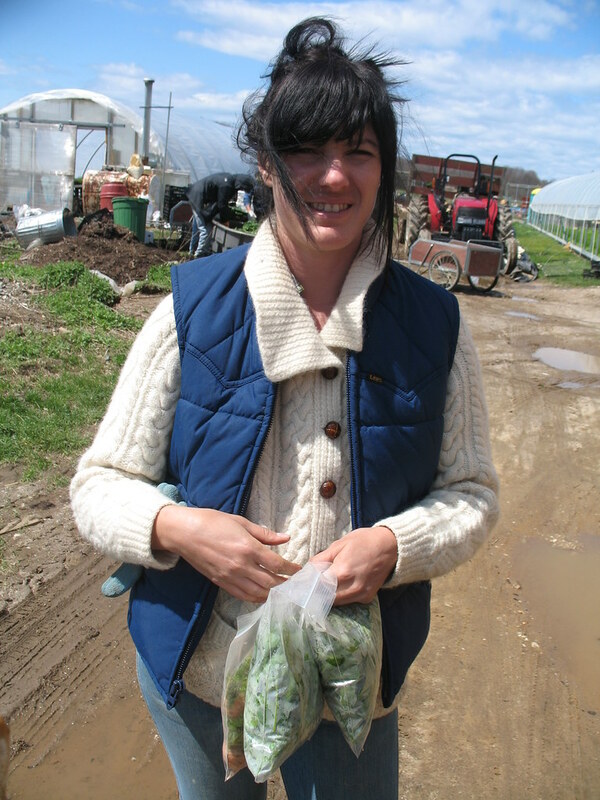 Her interest in food and where it came from was what drew her to farming, and her decision to embrace it hands-on for an entire season (March to November). Trading the subway for tractors and heels for sodden clogs, she works from eight in the morning to six in the evening, taking breaks for communal meals, and sharing living space with her co-workers. I can’t even really begin to imagine how drastic the switch must be. She noted that in the city, it was easy to pick up a snack of junk-food from a bodega. Now, several miles from any business that isn’t a farm, and between the work and a healthy, farm-fresh diet, she’s lost some ten pounds so far (not that she needed to). But all this hasn’t stopped her from cooking. During lunch break when I visited, all the workers gathered in the farmhouse for a family-style meal. They take turns at preparing the meals, and another is appointed the dishwasher. 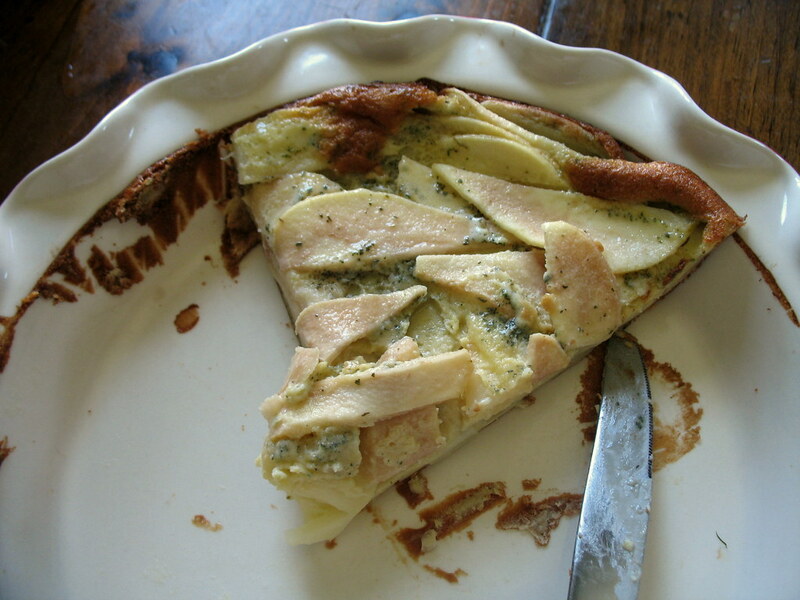 Though it wasn’t her turn, Melissa made a pear custard tart for dessert, which everyone dug into eagerly. While most workers hail from the states, two men are South American, via MESA exchange program. They speak little English, and are pretty unfamiliar with many of the crops grown on the farm, according to Melissa. Pointing to the tart at the table, one of the workers tried a few words in Spanish to describe it. The South American men nodded and sounded out a few more words in between bites, but for the most part, everyone seemed to be too busy enjoying the dessert to tie down an exact translation. As the busiest season for the farm approaches, it has some exciting programs up its sleeve. Thanks in part to Melissa’s expertise, the farm stand will soon begin serving lunch to the public, and a tantalizing, all-vegetarian menu is in the works. Visitors (not just goggle-eyed bloggers) will flock to the farm for tours and educational workshops. There is an annual Garlic Festival in early fall in which various garlic-oriented vendors will set up camp and a garlic cook-off will be held. And the farm will become a pick-up location for a raw milk club in the area. But most excitingly, to me at least, Garden of Eve will hold cooking classes this summer to the public. Most will be taught by Melissa. One will be taught by me, on July 12th. It’s going to be on vegetarian dumplings, of all varieties, using all sorts of summer’s bounty. And I just can’t wait. More on that as the time approaches. 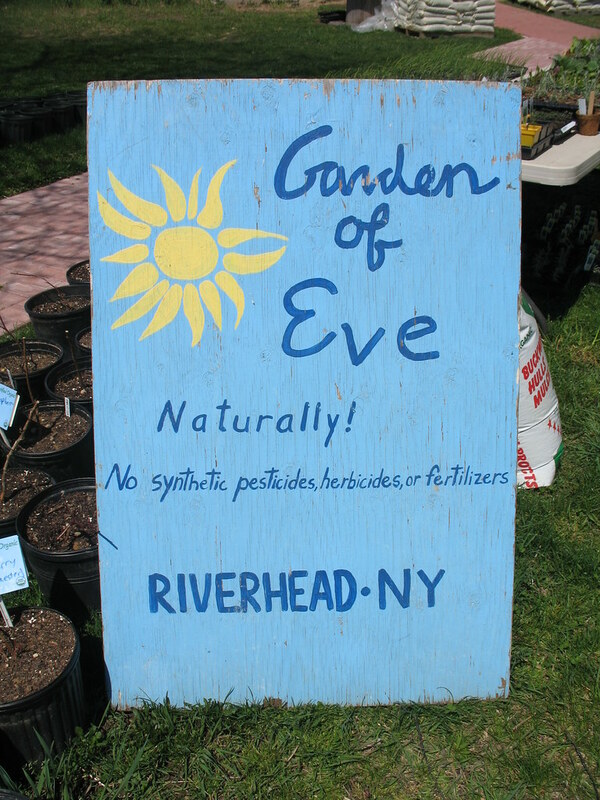 For now, you can still visit Garden of Eve every weekend, or go to the McCarren Park Greenmarket in Brooklyn or Atlas Park Greenmarket in Forest Hills, Queens every Saturday to find Garden of Eve’s produce stand. If you’re a Long Islander (sorry if I’ve offended any of you with that intro), the farm sells at West Hampton Beach Greenmarket as well as right on on the farm, in Riverhead. Thanks for posting this! I have been a member of the Garden of Eve Carroll Gardens CSA for 3 years now, but I’ve never made it out to the actual farm. It’s great to see what goes on before my Saturday morning pick-up! Thanks for visiting us! We’ve gotten quite a few emails since you posted this, from your readers who are also CSA members. I hope it is an inspiration for all you NYC CSA members to finally get out to the farm. There is a world beyond NYC, though I know you all get separation anxiety. Hooray for foodies visiting farms. I love it. And I hope you post recipes for veggie dumplings. I can’t wait to try it out when all our summer stuff starts coming online. — A fellow hapa who happened upon your blog through a Google Alert (random!). Thank you for your post. Being born and raised on LI, reading your story brought back so many happy memories of scouting out farm stands, pumpkin farms, wineries and corn mazes. I didn’t know about this farm and I am looking forward to visiting it next time I visit the family back home. We just signed up for our half-share on the Upper West Side, and its great to connect to the farm. 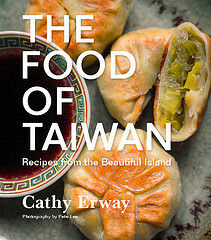 My husband and I are looking forward to visiting the farm, and attending the dumpling class! Thanks for making the link to the outside world. THERE IS SO MUCH outside this City!!! A buddy encoraged me to look at this page, brill post, fascinating read… keep up the good work! Fantistic website design you have, i might hire you to do mine! Haha! Hi i read your site often and wanted to wish you all the best for the New Year! 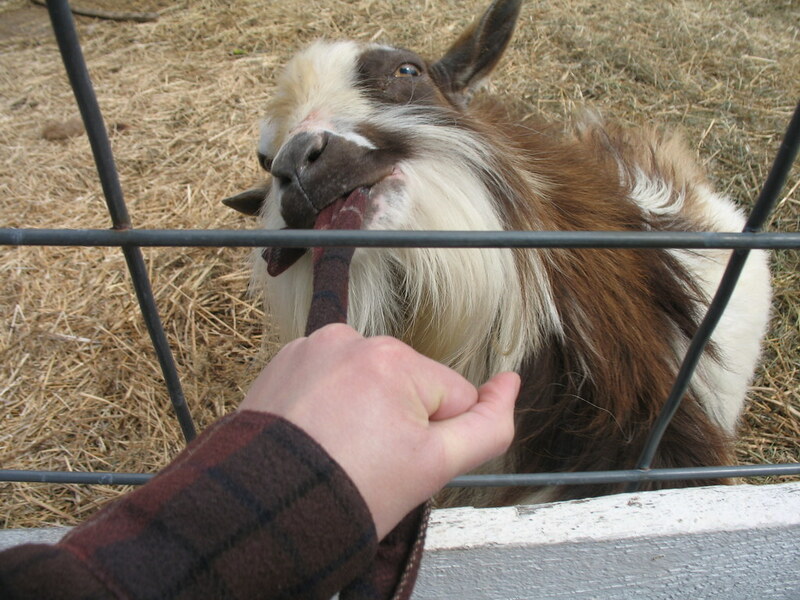 I’m a huge advocate of visting local farms. I live in Ohio, so you can only imagine how amazing the farms are here. It’s a great state for farming. late 1960s, many younger people began a ‘back to the earth’ movement in an attempt to draw a closer connection the land that they instinctively knew sustained them. its crops, which in turn are used to feed the animals.